Dark Island is a diversion from my usual drinking, and thats partly because I didn't buy this one! Dad bought this one home after he'd been to a beer tasting, because he had been watching a programme about whisky in the Orkney Islands the night before. Dubious logic, but I'm happy to drink anything free. This is brewed in the Orkney Islands, which is simply the group of Islands to the north of Scotland. This is an area I know very little about, however I am aware that only about 20,000 people live in the Islands and that it's quite cold all year. This suggests to me that this dark beer could be quite warming and nice, let's hope so or serious questions need to be asked of the importer! As the name suggests the beer is dark, black almost, with a 3-4 finger sized creamy coloured head. The beer has shining ruby streaks throughout when held up to the light, and the head seems to darken over time to an almost tan colour. I can't discern any obvious carbonation by looking at the beer, but with the good retention of the head there must be some. The head takes a long time to fade and when it does it forms a ring with a film over most of the beer and laces the glass brilliantly. Who knew the Scots could produce such a good looking beer! This beer has quite a muted aroma compared to similar beers I've had before. There is the traditional roasted malt aroma as well as a very fruity smell. The fruity aroma reminds me of plums and figs, are smell quite ripe. Towards the back end of the nose the beer developes a smokey coffee smell, which gives the impression that this beer would be a good winter beer. It smells almost warm, it's quite a different aroma to almost any other beer I've had. 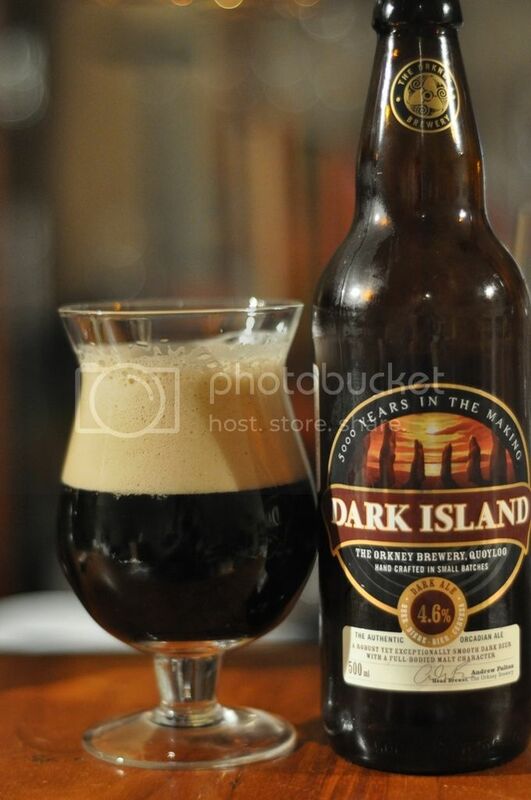 Dark Island starts out with a very fruity flavour, before settling into a flavour pattern that from the nose was unexpected. This beer has a smokey peat flavour about it, which dominates the beer and is very warming. The warming sensation is added to by a finish which has flavours of nuts and spices. There are definitely cloves present as well as something that I can only describe as like Fruit and Nut chocolate, it's a very distinctive almost cherry chocolate flavour. It's very easy drinking!